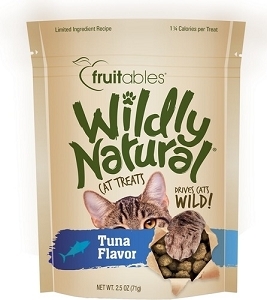 Fruitables Whole Jerky Alaskan Salmon Strips Dog Treats are natural grain-free jerky treats with a mouthwatering flavor that drives dogs wild. Your little carnivore will drool over the delectable taste of premium grilled Alaskan salmon filet. 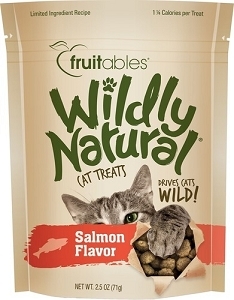 These tasty chews feature a simple recipe of truly limited ingredients–just salmon and natural flavor—and no fillers to upset tummies or trigger allergies. 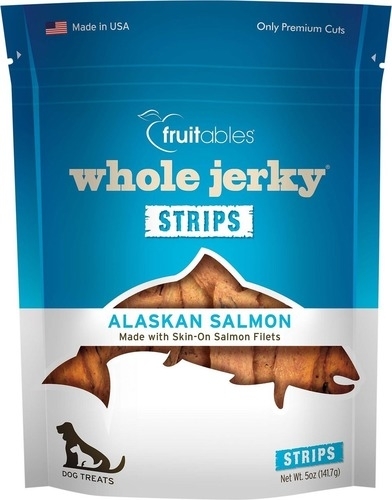 Grilled Salmon Jerky... Made with only the finest skin-on Alaskan Salmon fillet meat, these treats are wildly tasty and healthy beyond description. Your little carnivore may not get to run wild through Alaskan streams catching river run salmon, but these tasty rewards are as close as you can get. Remember to introduce any new proteins sources slowly. 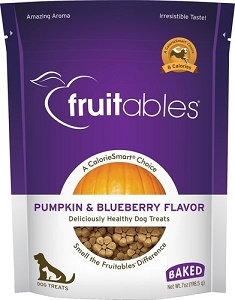 Meaty cravings: Fruitables Whole Jerky is so tasty that it may cause your dog to drool, tremble, or howl in anticipation... don't worry, these meaty cravings are perfectly natural reactions. Enjoy, share with friends, and have fun!